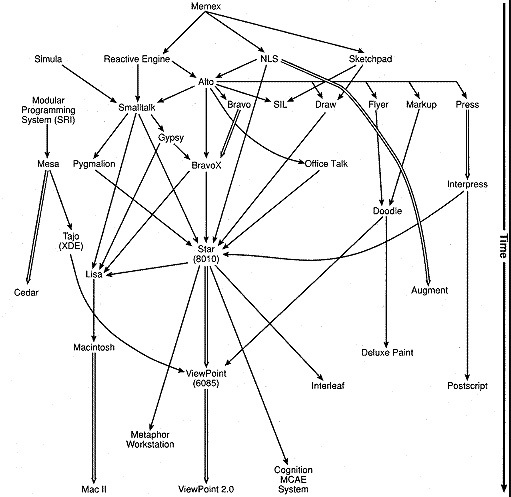 In 1999, John Redant, then a student at university in Canada, with input from DigiBarn curator Bruce Damer and others filled out the original "bushy tree" diagram of the lineage of visual computing systems (mostly software). The goal was to bring this diagram up to the year 2000. You can understand this diagram in the context of John's article Contributions and Downfall the Xerox Star. Many of the "leaves" in the tree above are clickable and will bring up associated web resources. Find more about the Bushy tree in contributed comments below. If you would like to correct, add to or otherwise help us describe the bushy tree better, please contact us. New! John Redant updates the famous IEEE Bushy Tree as a Wikia! Comments by virtual visitors about the new "Bushy Tree"
Vannevar Bush was already famous as a designer of analog computers, and also an expert in the field of micrographics. He was already aware of the automated electronic information retrieval/control systems in use at places like MIT. Their origins lay in Europe with the coterie gathered around Paul Otlet, and they had a fully functional hypertext system with iconic access in 1912. Despite the War and the Depression, the march of both micrography and automated retrieval proceeded apace, and Bush was involved with their use in documentation during the war. The problem was not with rapid recall - that was well established. It was with the recording side of things. Micrographing and encoding took some time, and a significant part of what he envisaged in the Memex was the instantaneous storage mechanism he hoped would arrive. The significant thing that seems to bypass most histories is the fact that Bush had already built this type of machine at MIT, and perhaps more significantly co-operated with Kodak and NCR to work on the mechanisms that derived in part from his differential analyzer (the Comparator and the Microfilm Rapid Selector). Charles Simonyi and most of the BravoX team left Xerox for Microsoft as a group, around about 1982 or 1983. The first version of MS Word, which appeared maybe a year later, was essentially just a port of BravoX to MS-DOS. If you read the BravoX manual, you can see that it already has MS Word features such as Styles. MS Word also shows its ancestry in its native file format. Bravo and BravoX stored out files by essentially just dumping the memory heap. This made saving and loading documents very fast, but it also meant that a) the file format was not at all easy to decode, and b) some strange stuff, such as previously deleted text, is stored out along with live text. These idiosyncrasies of the file format are still present in the current version of MS Word. Visit our Alto 30th Birthday Bash pages where we feature audio and video wherein Charles Simyoni describes the relationship between BravoX and Word. What about Interlisp-D, which, in the early 80s, implemented the programming language in a graphical environment on Xerox workstations? Interlisp-D, Smalltalk, and the Star workstation all ran on the same Xerox D-machines. Richard Burton, Warren Teitelman, and others were responsible for the development of Interlisp-D at Xerox PARC. The language itself (Interlisp) originated at BB&N. Interlisp won an ACM award, partly for its innovative use of graphics. InterLISP did run on a Dolphin (can’t remember which one, if I ever knew). It also ran on a Dandelion, and perhaps others. I wish that I could tell you exactly where Interlisp joins the tree, but I can’t. The Interlisp-D people were in the same building as the Smalltalk group. There was a lot of communication, but also some rivalry between the two. As I recall, Interlisp-D, like Smalltalk, was spun off by Xerox in the 80s, but I don’t think that the spinoff made it. By that time, a reasonably good Common LISP was available for the Macintosh, called, appropriately enough “Macintosh Common LISP.” It was quite popular among those in my community (AI in education). It is still available from Digitool (http://www.digitool.com). I think that it’s lineage is more that of the MIT AI LISP Machine. Two other systems, built for children, might qualify as graphical computing environments. Logo, the brain child of Seymour Papert (MIT AI Lab) and Wally Feurzeig was originally a symbolic programming language for kids. Papert added a graphical component in the form of a “turtle” that moves about the display under program control, carrying a programmable pen that can chart its progress. Logo is still popular and is being taken in several interesting directions, for example Starlogo http://education.mit.edu/starlogo/. Logo is interesting in that it’s graphical primitives, turtle movements, are really quite different than those (strokes and fills) employed by other graphical computing environments. There is even a book Turtle Geometry, by Harold Abelson and Andrea diSessa, on the theoretical foundations of turtle graphics. Another outgrowth of Simula are environments based on finite automata. Starlogo is one of these. Also, in the eighties, Apple had a product known as Cocoa (not what they now call Cocoa) that allowed kids (of all ages) to program up a bunch of finite automata using a WYSIWYG, drag-and-drop interface. The automata could move about the screen on their own, interact with other nearby automata, change appearance, etc. Cocoa’s immediate descendant is a product called Stagecast (http://www.stagecast.com). Stagecast is hosted in Java. AgentSheets (http://www.agentsheets.com) is a similar product, but I can’t tell you anything about its history. Another branch that I don’t see (or can’t discern) in the tree are event-driven graphical programming environments, that is, systems in which someone drags a bunch of user interface elements onto a display and then defines the behavior of each in order to create an application. Examples that come to mind are HyperCard, ToolBook, and their descendants. Also, I suppose that Visual Basic and the like fall in this category. Brings back old memories whey I look thru your Xerox Star stuff. I worked for a division of Xerox, called Versatec for 10 years (83-93), and the last 11-12 years I worked for Sun. I found your chart on the evolution of Graphics very interesting. I have always felt there was a connetion between Java and Postscript (really Interpress). I used an 8010, 6085 as well as GlobalView (on SunOS). I even use to hand write Postscript programs (for demos of course) so thats why I draw the connection. The reason I am writting this is to add to your evolution graphics. Versatec took the Star (in June 1985) and with a CAD/CAM package tryied to market it as the Expert system. The group within Versatec was called the EIS group. I actually have a picture as well as a write on its introduction into the market we did at the DAC event in June of 1985 in Las Vegas. IT even mentions the first customer that bought one. I can Scan and send to you the picture if your interested for you website. We did this for about 3 years before Versatec pulled the plug, because EXPERT was not sucessful. But I attribuite this early work to where we are today. Since you were in the heart of the 8010 developement, you may remember this EXPERT CAD system ... I recall, we had great Xerox GUI environment and the other "turn key" vendors (Daisy, Cadnetics, Intergraph) had very simple menu driven interfaces in to their package. I guess we were way before our time with the GUI, and people really did not understood the power of what you and your colleges created. Great Work!!!! Anyhow, let me know where I can send a picture of the Xerox "Expert" CAD system to, I would be happy to add to history. One last comment, I don't see NeWS anywhere in there ? Remember this was the Postscript based GUI environment that Gosling came up with, where the rendering was don via Display Postscript. It was Sun's attempt to bring a Standards based GUI to the Market, but we all know that X Windows won out as the standard. The GUI Sun built for NeWS was SunView. Maybe its this event that makes me feel the connection between Java and Postscript. If you would like to correct, add to or otherwise help us describe the bushy tree better, please contact us! The original version of the figure (8) from The Xerox "Star": A Retrospective, a paper appearing in IEEE Computer, September 1989 and also in the book Human Computer Interaction: Toward the Year 2000 by Morgan Kaufman. An excerpt from this paper follows, explaining Fig. 8 -- How systems influenced later systems. Draw, by Patrick Baudelaire and SIL (for Simple Illustrator) by Chuck Thacker (main designer of the Alto) were intellectual successors of Sutherland's Sketchpad (see above): graphical object editors that allowed users to construct figures out of selectable, movable, stretchable geometric forms and text. In turn, Star's graphic frames capability is in large measure an intellectual successor of Draw and SIL. Large systems from ENIAC on up to the early 1960s. 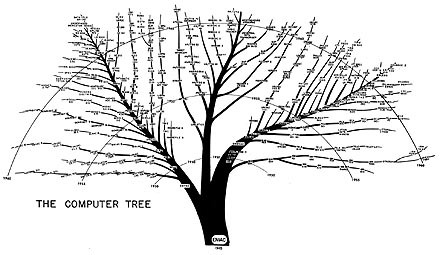 An updated Computer Tree (to 1970) from the endpapers of the Computer Yearbook for 1969 (Computer yearbook and directory Detroit [Mich.]: International Electronics Information Services, 1969-1971. Thanks to Diarmuid Pigott for scanning this. Click here for a medium sized verson and here for a large version.